While I was looking for an alternative to the expensive rhinestones and came across a great material- the glass mosaic tiles. In fact the mosaic tiles turned out to be a much effective embellishment than any rhinestones or beads. The glas tiles have a natural crystal shine, they are super light yet solid and the rough back makes it easy to glue them onto any surface. The tiles are available in every craft store in different sizes, quality and price range. But by ca. 5€ for 200 pcs the mosaics definitely beat any embellishment available on the market. 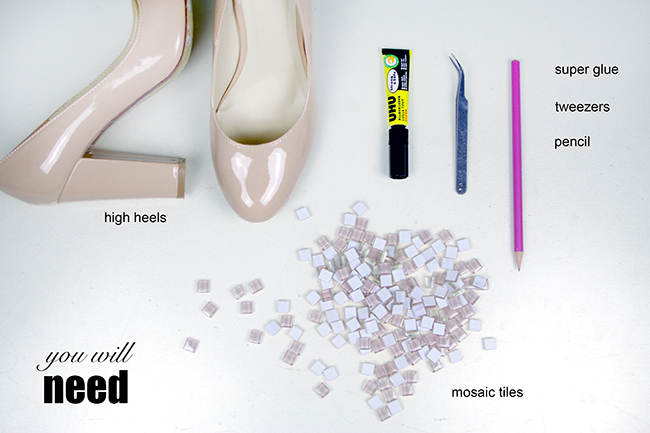 2 days until New Year Eve- enough time to give your high heels a glamorous shine under 10 €. For this design you will need 1x1cm (0.5″x0.5″) glass tiles with rounded edges ( You don’t want to hurt yourself while taking the shoes off). I strongly recommend the UHU Super Glue. It’s fast and it bonds forever (I tried unsuccessfully to remove a sloppy piece). 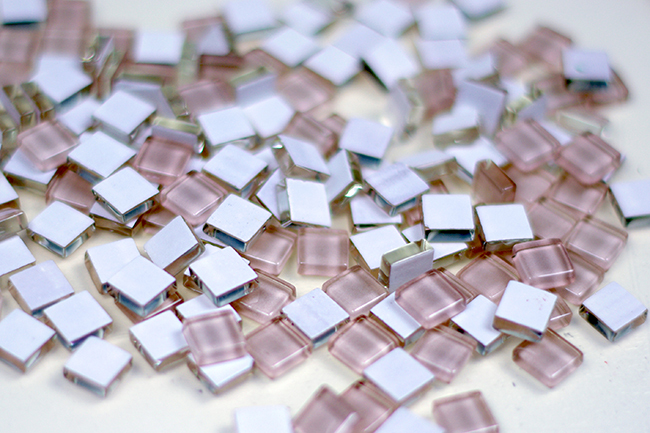 If you pick the mosaic tiles, make sure the tiles have rounded edges and a rough back part. 1. Clean the heel with water and paper towel. Then draw the lines for the tiles with the pencil. 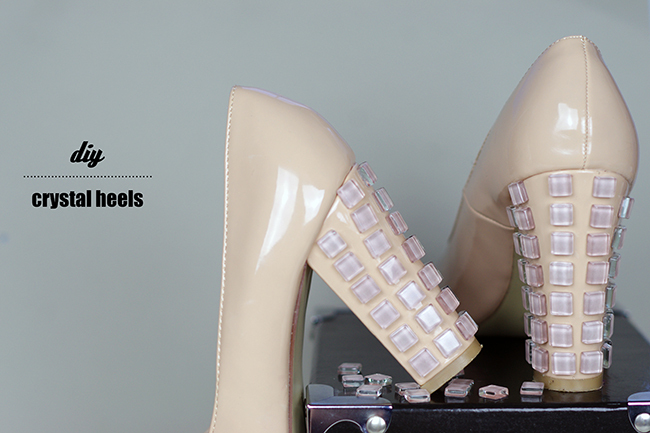 If your heels are made of suede or similar, clean it with a brush and then draw the lines with chalk pencil. 2. 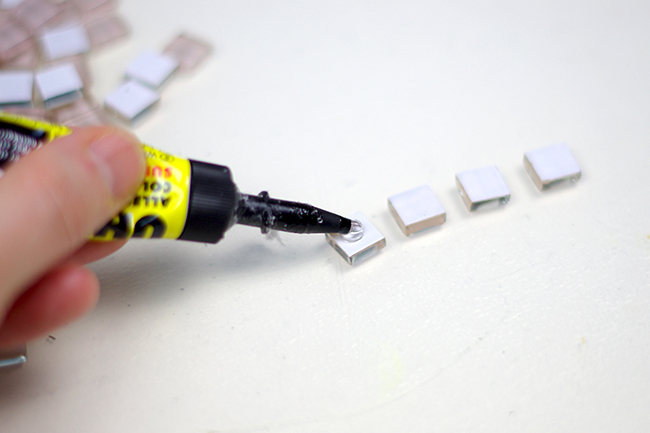 Apply small glue dot to the rough side of the tiles and spread the glue over the tiles with a wooden stick. Wait for about 3 min then press the tile onto the heel. 3. Use a wooden stick or a ruler to align the tiles. 4. Glue all the mosaic tiles all over the shoe’s heel. Then clean the surface of the tiles with nail polisher.